Have you visited Peachtree Corners? With over 75 “Peachtree” streets and towns in the Atlanta metropolitan area, you might not even know where it is! 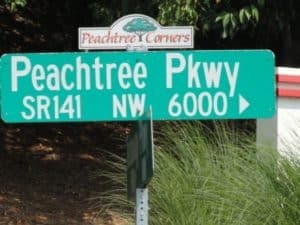 Here’s a quick reference – Peachtree Corners is located about 5 miles OTP, and is bordered by Chamblee to the South, Alpharetta/Roswell to the west, and Johns Creek to the North. It’s Gwinnett County’s 16th (and newest!) city, officially established on July 1, 2012. We happen to be particularly biased because our incredible Keller Williams Market Center (KW-speak for office) is located at “The Forum” in Peachtree Corners, an open-air European-style mall with shopping and restaurants. The Forum :: have you visited the Forum on Peachtree Parkway?! It’s this cute outdoor “mall” for lack of a better term. Truly a shopping destination, it features everything from Trader Joes, to California Pizza Kitchen, to Juice Bar, to Moe’s, plus Francesca’s, Williams-Sonoma, Belk, HomeGoods, J.Jill, Charming Charlie, and so, SO much more. It’s tempting to spend a whole paycheck during a lunch hour, as our office is steps away from all of this incredible shopping! The great outdoors :: if shopping at an outdoor mall isn’t your idea of “being outdoorsy” (ahem), Peachtree Corners also has some incredible options and access to parks, trails, and the Chattahoochee River. After a 2015 study indicated that walking and biking trails are among the most desirable public amenities, the city began construction on a 11.5-mile multi-use trail system. More information about the multi-use trail and other public outdoor space can be found HERE or HERE. Food :: yes, yes, food has its OWN category. #NoJudgmentHere! Peachtree Corners is home to many restaurants, and we have picked our top five favorites. Grace 1720 :: for the vegan/vegetarian/gluten-free crowd! Ten Bistro :: for local & sustainable ingredients! Dog Days Hot Dogs :: not your average fast-food hot dogs! Restaurant 475 :: for life-changing peach cobbler! Hog & Ale Smokehouse :: we recommend the pulled pork! Are you thinking that Peachtree Corners sounds like your type of scene? Call The Peters Company to help you with your search – we’re your area experts!